Symptom: Dead, with a slight humming sound. When powered up, a slight humming sound would come from the speakers, indicating that at least part of the machine was getting power. No lights were coming on and the MPU was not booting. Checking the fuses, I found fuse (F113) bad, which powers the 5V logic circuit. I replaced the fuse and it blew again within a few seconds. I unplugged the MPU board and the 5 volt supplies to the playfield. With my multimeter, I determined a short existed on the power/driver board. I suspected the bridge rectifier had failed. Checking the rectifier I was able to confirm a shorted diode between one of the AC inputs and the “+” output. When I removed the old bridge rectifier, it was clear why it failed. When assembled at the factory, the screw was cross-threaded and the rectifier never made good contact with the heaksink. Heatsink for bridge rectifiers on the Power/Driver Board. Left end of heatsink never had a good thermal connection with the rectifier. Lately, I’ve been seeing a number if issues in pinball machines where the problem originated at the factory. For example, I was recently working on a Bally Scorpion and found a staple in the wire harness on the backbox light board. Anyway, after replacing the bridge rectifier, the machine powered up fine. There were a number of burned connectors in the backbox. There were a couple associated with the GI lighting on the light board and the play field, and another connector on the power supply board. I was able to re-pin one of the GI lighting connectors and the owner suggested just bypassing (removing from the circuit) the connector for the light board since it was unlikely that anyone would need to take the light board out of the backbox. Burned connector, CN1, on the power supply board. The power supply connector was problematic. I tried several ways to fix it, but it would just heat up and start smoking again. 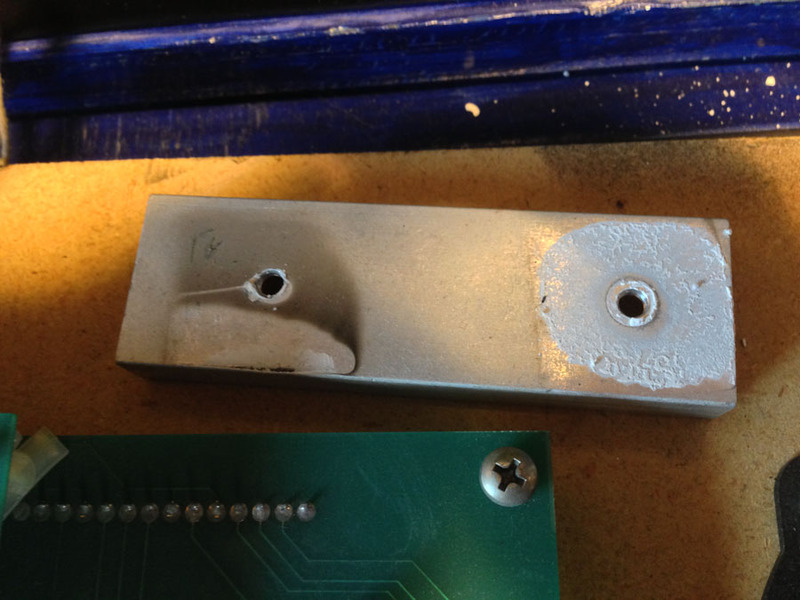 Part of the problem was the plastic had melted and mixed with the solder, making it very difficult for the solder to stick to the metal. I decided that it would be best to replace both the PCB mounted connector and its mate. Fixing the connectors solved all of the power problems. There were several switches not working. One had a broken wire. Another was mis-wired at a connector, making me wonder if it hadn’t left the factory that way. After everything was fixed, the owner and his son were trying it out and exclaimed they hadn’t seen various modes of the game previously. It hadn’t been fully working in the 10 or 15 years they had it. Symptoms: Record would load to turntable and immediately unload, mechanism continuously scanned, only even letters (B, D, F, etc.) would play. This jukebox had recently been purchased at an auction and the condition of it was unknown to the owner. I started with getting the mechanism to stop scanning continuously. There were two problems associated with this. The first was the add/subtract switch in the control center was sticking. There are two solenoids and a ratchet mechanism that is responsible for starting the mech scan and stopping it after two passes. After the add/subtract switch was working freely, it was evident that the subtract solenoid was never energizing when the mech reached the right end. The subtract solenoid is energized by two different switches. One is a service switch that the operator uses to stop the mech at various locations for loading records. The other is a leaf switch on the rear of the mech that actuates when the when the mech reaches the right end. The service switch correctly energized the subtract solenoid. The problem was with the mech switch. After removing the back cover of the jukebox, the mech switch was obviously bent. I removed the switch cover and straightened out the switch bracket. I reassembled and readjusted according to the procedure in the service manual. The add/subtract circuit then functioned normally. Next up was finding out why the record would immediately reject after loading onto the turntable. The first thing I did was to isolate whether the problem was electrical or mechanical. I held down the trip lever as the record was loaded. The trip solenoid buzzed loudly indicating that something was tripping it electrically. I checked the trip switch that senses when the record is finished and found it was stuck on. I removed the switch and flushed it with contact cleaner to remove the gunk that was causing it to stick. After several minutes of exercising it, it finally started to work. I remounted the switch and that problem was solved. Next up was finding out why all of the letters associated with playing the left side of record. I had read someplace on the internet that the PFEAIU only reads out in one direction. This is incorrect. It reads out in both directions like the majority of other Seeburg jukeboxes. It took me a bit to find the problem, but it ended up being a broken wire on the Tormat contactor block. Visually, it looked okay, but electrically it wasn’t making a connection. I resoldered the wire and all was working. I lubricated the mechanism. The amp sounded like it needed to be rebuilt, but I noticed that someone had replaced some of the capacitors in the past. The sound improved as we played more selections and the owner was happy with it as it was. P.S. After the original 100 play series, I’ve never understood Seeburg’s model numbering system. Symptoms: Display not working, dim playfield lights, needed tune-up and testing. The player 1 display only had a single digit working (10,000’s). The first thing I did was swap it with the player 4 display to make sure the problem was with the display and not the MPU board or a connection problem. The problem moved to the player 4 display after swapping, indicating the problem was with the display board itself. With my oscilloscope, I verified the signals going to the display and the outputs of the driver transistors. The other digits were working fine but were not illuminating. The 10,000’s digit had a shorted transistor (Q11, 2N5401) which kept that digit on all of the time. Normally, only one digit is turned on at a time, but it is done so fast that the human eye doesn’t detect it, giving the illusion that all digits are on. In this case, with one digit shorted ON, the other digits stop working. I’m guessing it has to do with ionization of the neon gas. I replaced the transistor, and the other digits started working normally. The controlled lamps on the playfield were dim and when in test mode, the power supply in the backbox would start buzzing when all of the lamps flashed on. I checked the voltage at TP1 and it was around 3V, which is too low. 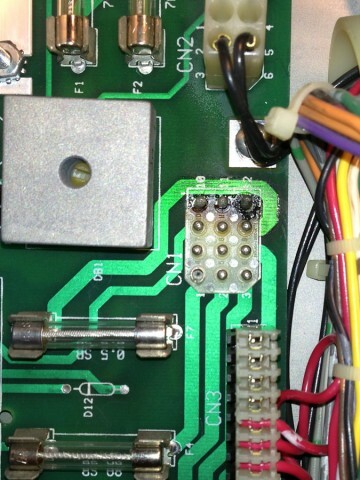 The symptoms of buzzing and the voltage being about half, indicated a bad bridge rectifier (BR1). This rectifier fails on many Bally machines of this era. Once replaced, the playfield lights were at normal brightness and the buzzing stopped. Symptom: Wouldn’t boot up. Battery leaking. Before powering up, the first thing I did was to remove the leaking NiCad battery from the MPU board. Fortunately, it hadn’t damaged the PCB traces. I replaced the RAM with an anyPin NVRAM module. The machine wouldn’t boot when power was turned on. I checked the power supply first, since the power supplies in this era of Ballys are notorious for failing. All voltages were good. The light on the MPU board flashed 7 times on power-up which indicated that most of the boot sequence was executing, but it was stopping just short of going into “Attract Mode”. With my oscilloscope, I started probing around the MPU board. The processor was running and there was activity on the address and data buses. There was no activity on the IRQ (interrupt) line (pin 4 on U9). There are two sources (that I’m aware of) for interrupts. One is the display, the other is the AC zero crossing detector. I checked the display interrupt generator, which is a 555 timer at U12. There were pulses on pin 3. Next I checked the zero crossing detector and found no pulses there. The problem ended up being the 2.0K resistor (R113) at the input to the board, and is the top part of a voltage divider in conjunction with another 2K resistor at R16. Fortunately, Radio Shack still carries resistors (although the guys working there have no idea what a resistor is or what it does). We were able to get a 2.2K which is close enough. Once the resistor was replaced, the machine booted up just fine.